Home Economy Retirement Quit Living So Long! As career-average wages go up, the replacement rate goes down. The numbers slide all the way to the top of the earnings scale, where those earning the maximum amount taxed for Social Security have about 26% of their income replaced by the social safety net. On the face of it this seems unfair. If 12.4% of one person’s income, the combined amount of FICA tax paid by employees and their employers, is enough to provide the worker with 53% of his career-average wages in retirement, why is this not the same for everyone? Eventually, this conversation will lead to “fairness” based on absolute dollars, but that doesn’t hold up. Taxes are based on a rising percentage of earnings, even though no one gets more police protection, road construction, or national security simply because they pay more in taxes. Of course none of that matters. People who earn more and save more must be the bad guys, because they have the cash that other people need. So the government must get it from them any way it can. Which gets back to your pesky longevity. 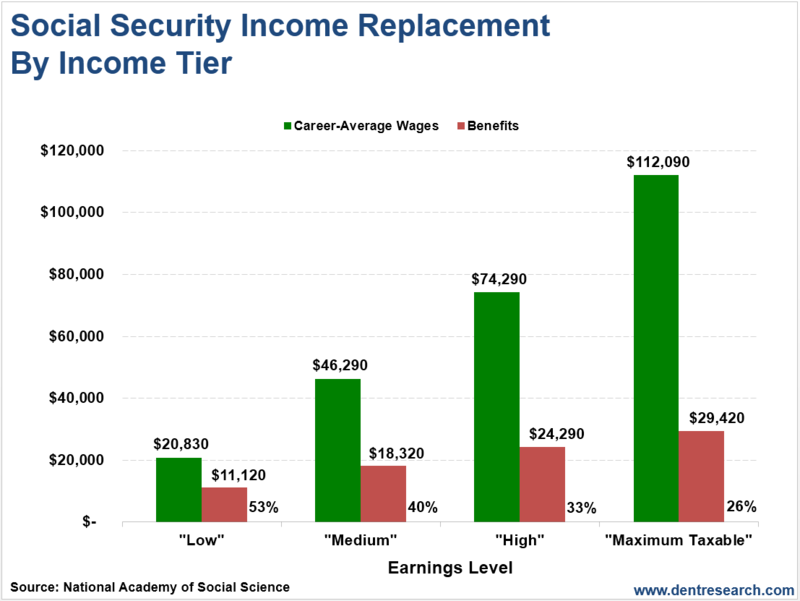 It is true that Social Security provides better benefits to those who earn less, but only on an annual basis. If we calculate the overall benefit provided, which must take into account the length of time over which benefits are paid, then the equation gets turned on its head. Even though high earners receive lower benefits, they tend to outlive those who earn less by about a decade. Those extra years of cashing Social Security checks really add up. On average, it tilts the return on total Social Security payments made while working in favor of those at the top end of the scale. Once again, rich people win, darn them! The clock is ticking on Social Security. It’s already insolvent on an annual basis. The system brings in less money than it pays out every year, and its unicorn (meaning mythical) trust fund will be depleted in roughly 18 years. The chorus calling for change will grow louder, and the obvious answer will be to cut the benefits to those at the top. Clearly they get too much as it is. I don’t expect a call for actually reducing the dollar amount paid to high earners. Instead, I’d guess that legislators will go for the low-hanging fruit. They’ll simply increase the amount of earnings that are taxable for Social Security without raising the top level of benefits paid. This will have the same effect as lower payments, but won’t have the same optics. No matter how a change is characterized, it will mean the same thing to those hit with the higher tax. They’ll have less money for their own financial needs. While such changes are probably inevitable, investors don’t have to wait around to see how the movie ends. They can take proactive steps today to shore up their income in retirement. By purchasing guaranteed streams of income that start later in life, or even building portfolios that leverage income-producing securities, you can shape your own financial future in a way that minimizes the effects of Social Security on your standard of living. These are two topics that we’ve recently covered in our Boom & Bust newsletter. Given that people reading this are most likely in the “going-to-live-longer-so-you-should-get-less” category, these moves could give you peace of mind just when you need it most – in your long, comfortable retirement.